Prong and Choke/ Check Collars: the Good and the Bad! Prong and chokers are common tools seen in dog training, usually made of metal, they sit around the dog's neck providing a correction (tightens) when the owner pulls/jerks the leash. 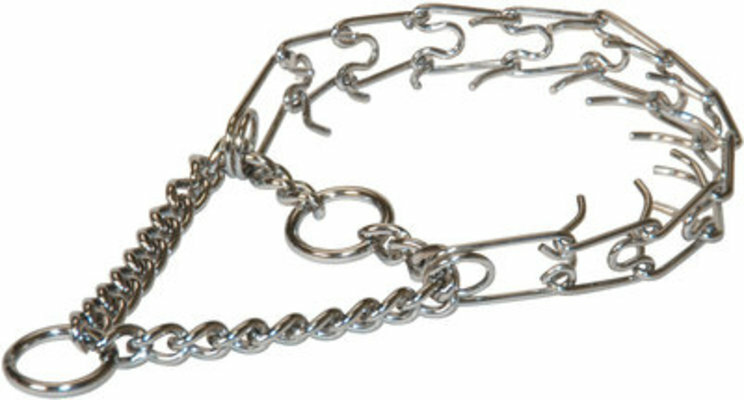 A choke collar is a chain looped around the neck which tightens while the prong is a collar of metal spikes with a chain loop, these spikes will tighten, pinching the neck. It is said that prong mimics a mother dog's bite- which they use to correct their young pups. However, with little scientific backing and no older female dog present this is likely not the case. It could be stated that the collar allows for more evenly distributed pressure on the dog's neck then a flat collar or choker-but why is it necessary? Correction collars are positive punishment and negative reinforcement based which means: They are used to stop the dog from engaging in a behaviour by adding an aversion: pain or used to get a dog to complete a behaviour, where the aversion is removed after (eg. sit). The actions of the collar are often not combined with consistent language and the dog is forced to figure out how to behave with no/little direction other than a tightening of the collar. This means the trainer will have to depend on a collar to get a response if they do not combine this collar with positive reinforcement. Positive reinforcement shows your dog what to do and in almost all cases makes any kind of pain or punishment unnecessary (sometimes- removing attention to stop a behaviour such as jumping may be needed; negative punishment/extinction). Corrections can also lead to hyper vigilance as the dog does not always know when to expect a correction. Now some will claim that prong doesn't hurt the dog, but if it didn't, it wouldn't be very effective, would it? Consider a hot stove, if you touched it and it only seemed slightly warm you'd keep engaging in this behaviour but if it caused a slight burning sensation you probably wouldn't do it again. Same thing for these tools. These same people claim to try on the collar and express that it was mostly pain free, however, human skin 2x-3x thicker than a dog's!1 Even so, the neck is a highly sensitive area with many important elements; the trachea, esophagus, lymph nodes, thyroid gland,veins, muscles and spinal cord. All of which can be bruised or injured with one good tug. Still, if used properly it is said that these collars shouldn't cause permanent damage, but this has been refuted by a study in 1992 which claims that any collar can cause damage when it jerks or pulls on the neck.2 Additionally, see Eileen Anderson's blog for more on how prong collars can hurt based on pressure points – link. With pain also comes fear and potential aggression, which not only applies to the tool but the surroundings at the time of the correction as well. This is extremely true when using these collars on walks as they provide constant pain and discomfort due to pulling or other behaviours. Even with near strangulation most dogs will continue to pull against these collars as the drive to pull can override the pain. Dr. Stanley Coren, relates this to their evolution from predators which had to hide their pain for survival purposes and work through it to get their next meal.3 He additionally, provides studies which suggest dogs do feel pain and it can affect their health. The use of correction/pain/fear, social anxiety and frustration are the some of the leading causes of social reactivity.4 Though the former is more seen on leash (as they have no escape) it can leak into their off-leash interactions, causing them to act more irritable around dogs; as seen in our daycare. Therefore, even if you are interested in using these collars in your training you shouldn't use them for walking in public areas or on a fearful /poorly socialized dog to further prevent or increase reactivity. You may be able to utilize this collar with confident overly friendly dogs but there are better options for all dogs including front clip harnesses and headcollars. Though no matter the tool, you still need to train your dog to walk properly, the tool is only to support your technique and allow you to work with your dog (not control them!). Note prong is suggested for aggressive dogs to “keep them at bay”- they never claim that you can counter-condition aggression, positive reinforcement methods can! Choke collars can be used for the same purposes as prong and have similar side-effects but also seen as more damaging. In all the only good use for a choke collar is to prevent your dog slipping a leash on a walk or for reducing collar chewing-when your dog stops chewing switch back to a normal collar. They should NEVER be used unsupervised (eg. Tie-out).This is because the biggest risk involved with this collar is it getting caught and it tightening enough to choke out the dog (a flat collar can also do this unless its a quick release.) These collars are seen as inhumane even by those that use prong due to the pressure they apply and the fact the choke trainers would have the dog wear the collar at all times. Now, you read all this and your saying to yourself, they just have a bias view. Prong collars are perfectly effective tools when used properly. Okay. Some how does one use this collar effectively? Leerburg says they should fit snugly below the jaw with the leash attached on the right side of the neck, the leash should be attached to the dead ring most of the time.9 According to them live is only if the dead ring is not enough -some trainers use live all the time. So how do you switch to the live ring if your dog is lunging and barking without letting them get loose? The only solution Leerburg would supply is a slip-collar; similarly to the choke collar it will tighten in a way the dog cannot slip it and could potentially choke them. They call it the Dominant Dog Collar and even suggest it is more humane than the prong collar. Additionally, Leerburg states that some dogs can be overstimulated and aggressive due to the prong collar so their slip-collar would be a better option. This collar's additional purpose is to prevent escape if the prong un-clips (the links were not attached properly or worn out).9 Another trainer will agree with placement of the prong collar but states the leash should attach in front and only shift slightly to the side, as the prong could damage the throat.6 This trainer is also one of few to mention prong should not be used on young pups under 6 months old as it is too extreme. This trainer also differs in opinion in the belief that this collar is not for every dog. Yet another trainer states the collar should sit mid-neck fairly loose, only being present to the dog during a correction, with prong on back of neck and leash in front. This trainer mentions how some of their field differ in opinion about what size prong to use, as some say small prong clips are better- they cause more pain- this trainer says prong size should increase with the dog. The last trainer suggests the dead ring lets the dog adjust before moving to the live ring for the rest of the training- never to return to the dead ring. Interesting considering this trainer mentions transitioning dog's off prong to a collar. These trainers also mention positive reinforcement and utilizing the dog's drive- showing even with correction there is a need to redirect the dog. To conclude, as positive reinforcement trainers we will encourage you to avoid this tool as there are many good options out there that do not require aversion to work. The trainers in the correction field can not even agree on how the collar should be worn while all positive reinforcement trainers can agree a front clip harness is the best for pulling. From our research and years of experience we would suggest not using these collars especially on public walks (even the trainers suggest adding distraction in slowly to minimize over correction), with already aggressive dogs or with sensitive/fearful dogs. We will not make a claim that these collars are never necessary but will consider every option before resorting to them. Lastly, we want to create a loving bond built on trust and respect while avoiding pain or aversion. ~ Jayden Mayville, Manager and Trainer at Animal Antic Behaviour Centre. Interested in our training methods? Want a different option than prong/choke collar? We'd love you to join our obedience or leash walking class! We will discuss how to train with positive reinforcement, and what techniques and tools will work for you and your pup. Additionally, if you hand in your prong/ choke collar to us, you will receive $10 off a harness!